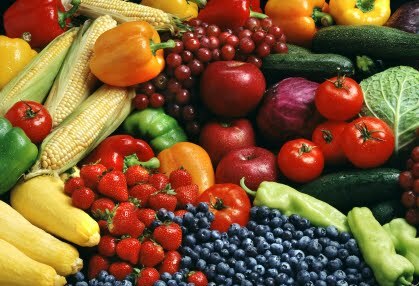 More good news on eating more fresh fruits and vegetables- they help with cholesterol levels! Most contain lots of fiber, which lowers cholesterol. Why then do so many of us have problems getting enough fruits and vegetables? One problem is that too many of us have become accustomed to convenience. We prefer the foods that require minimal prepping and consequently are often highly processed. Many balk at having to wash, peel, slice, and serve. Stated as such it seems pretty. Choose a time to prep your fruits and vegetables when you are not pressed for time. Then store the good food in proper storage containers and use within a few days. I also think that many of us are bored with the same fruits and vegetables that we have been eating for years. Look for new recipes to give the produce a new taste. Also, since we are becoming a more global world look for fruits and vegetables that you have never tried before. Have you ever tasted jicama, artichokes, arugula, daikon, rutabaga, fennel, butternut squash, or parsnips? Fruits that you may not have tried include mango, papaya, guava, kiwi, pummelo, quince, lychee fruits, passion fruit, pomegranate, kumquats, and ugli fruit. I was curious about the ugli fruit and found that “UGLI® is the registered trade mark under which Cabel Hall Citrus Ltd. markets its brand of tangelos from Jamaica. You should make it a goal to try at least one new type of produce every week. This could be fun and help prevent boredom with our fruit and vegetables. The following recipe is from the George Mateljan Foundation. 1. Slice onion and chop garlic and let sit for 10 minutes to bring out their health-promoting benefits. 2. Heat 1 TBS broth in 11-12 skillet. Sauté onions in broth over medium heat for about 5 minutes stirring frequently, until translucent. Add garlic and sauté for another minute. 3. Add zucchini, yellow squash, remaining broth, green chili, and cook for another 3 minutes or so until vegetables are tender, stirring often. Add tomatoes and continue to cook for another couple of minutes. 4. Add herbs, salt, and pepper. It feels as though summer has been here for a couple of months instead of being a couple of weeks away. Most of us agreed not to complain about hot weather if we could ever see the end of our long cold winter. Our memories get very short when we must make good on such promises. Well it is hot and that can be a good thing if you have a garden planted. It is that bright warm sunshine that makes the tomatoes sweet and the other garden vegetables have the wonderful summer flavors. Now is the time to start planning how you will use the bounty that can be harvested from even a small garden plot. Remember that most of the summer vegetables are low acid and need to be preserved using a pressure canner if you are planning to can the vegetables. 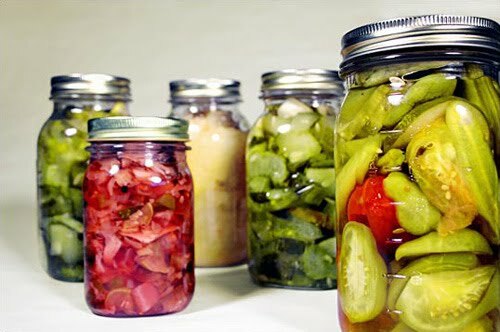 There is also the option of freezing and dehydrating in addition to canning. Simple dehydrators can be constructed to dry apples, tomatoes, and other fruits and vegetables. I have talked to some people who prefer to dehydrate their green beans. These are called leather britches. Fruit can also be pureed and dried to make fruit leathers. Dehydrated foods are perfect for people who enjoy camping and hiking. High acid foods, which include most fruits, can be preserved using the hot water bath. Of course making jams and jellies is another option for preserving fruits. If you are concerned with the large amount of sugar that is used with the jams and jellies, look for a recipe that uses less sugar or low sugar pectin recipes. The tomato varieties that we have today have less acid than some of the heirloom varieties. These tomatoes can still be preserved using the hot water bath but lemon juice needs to be added to the tomatoes to make them more acidic. If you plan to make a batch of tomato vegetable soup using a variety of vegetables, plan to preserve that soup either by freezing or using the pressure canner. The low acid vegetables need to be pressure canned. Botulism is the concern of low acid foods. When water boils in a hot water bath it never gets hotter than 212 degrees, the boiling point of water. The botulism spore can only be killed at temperatures that are around 240 degrees. The only way to get to this temperature is using the pressure canner. Another option for any extra produce that you may have is to donate excess food to the local food banks in the county. There are many people in the county that are not able to plant a garden and can certainly use the extra food!